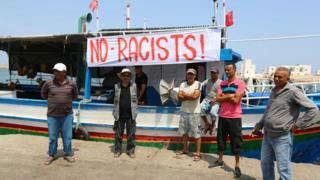 But the Zarzis fishermen said the anti-migrant activists were racists. They vowed not to let the C-Star refuel if it landed and the vessel is now expected to try another Tunisian port on Monday. "It is the least we can do given what is happening out in the Mediterranean," Chamseddine Bourassine, head of the local fishermen's organisation, told AFP news agency. "Muslims and Africans are dying." A port official who asked to remain anonymous said: "Us let in racists here? Never." Meanwhile humanitarian groups say any attempt to turn migrant boats back to Libya could be very dangerous and illegal under international law. About 600,000 migrants have been rescued from traffickers' boats and taken to Italy since the beginning of 2014. More than 10,000 people have died attempting to cross the Mediterranean over the same period. Earlier this month rights group Amnesty International accused the EU of mostly leaving it up to sea rescue charities to save migrants. At the same time, NGOs have come under criticism from the Italian authorities, who have threatened to stop vessels of other countries from bringing migrants to Italian ports. Italy's parliament has approved a plan to send naval boats to Libya as part of its efforts to stop migrants crossing the Mediterranean, and is asking NGO rescue ships to abide by a code of conduct.